Figure 1. 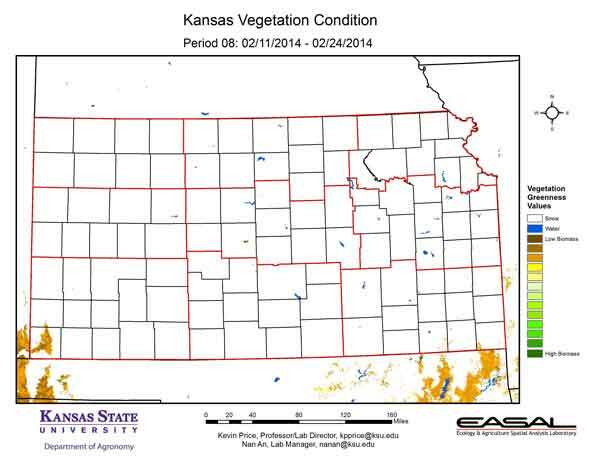 The Vegetation Condition Report for Kansas for February 11 – 24 from K-State’s Ecology and Agriculture Spatial Analysis Laboratory shows that snow continues to be a factor for much of the state. This snow cover hasn’t been continuous, and hasn’t had a huge impact on moisture totals. The Northeastern Division has had the greatest moisture totals, and that came in the form of rain. Figure 2. 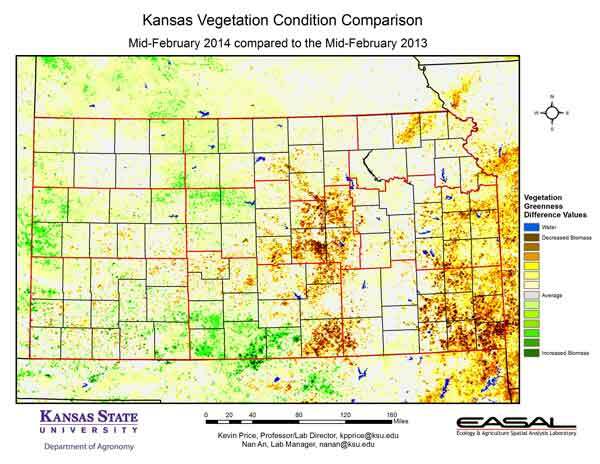 Compared to the previous year at this time for Kansas, the current Vegetation Condition Report for February 11 – 24 from K-State’s Ecology and Agriculture Spatial Analysis Laboratory shows the vegetation isn’t as active in the eastern half of the state. Cool temperatures have hindered development. 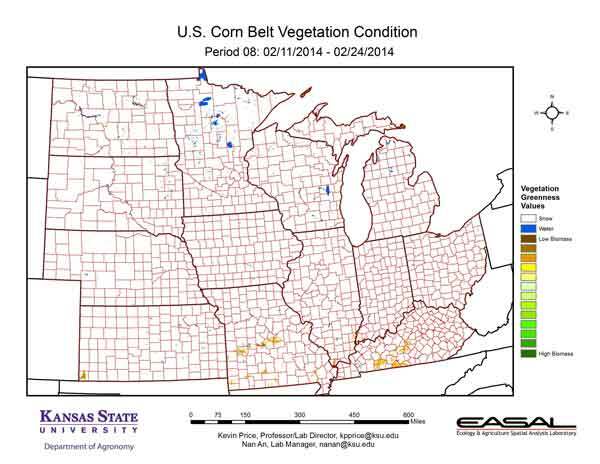 In parts of western and south central KS vegetative activity is higher. This is particularly visible in Greeley County in western Kansas, and Barber County in south central Kansas. Figure 3. 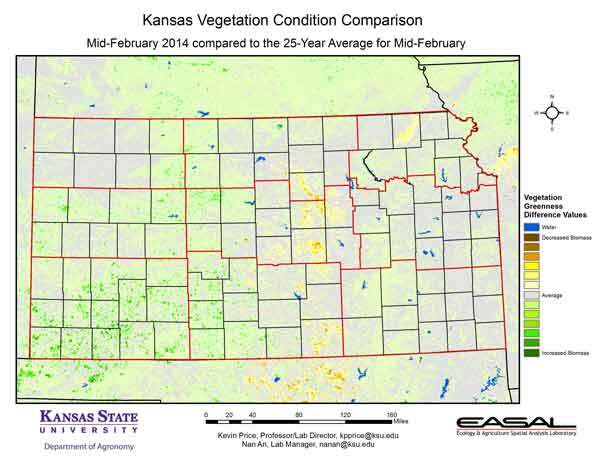 Compared to the 25-year average at this time for Kansas, this year’s Vegetation Condition Report for February 11 – 24 from K-State’s Ecology and Agriculture Spatial Analysis Laboratory shows NDVI readings are very close to average statewide. Above-average activity is most visible in the Southwestern Division. While temperatures are still cooler than average for the period, it has been the warmest region in the state. Figure 4. 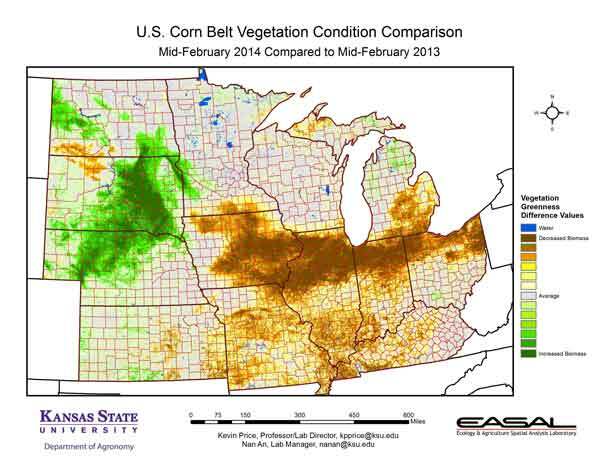 The Vegetation Condition Report for the Corn Belt for February 11 – 24 from K-State’s Ecology and Agriculture Spatial Analysis Laboratory shows that winter hasn’t given up its grip on the region. Snow was a feature periodically during the period. The snow cover has retreated from the southern parts of the region, but persists from Iowa to the Great Lakes and west from Nebraska through the Dakotas. Figure 5. 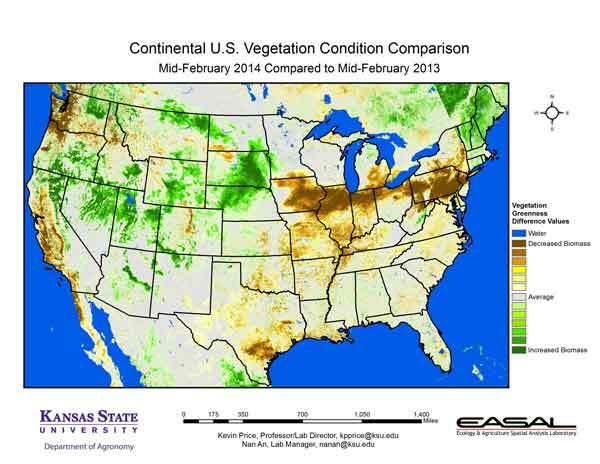 The comparison to last year in the Corn Belt for the period February 11 – 24 from K-State’s Ecology and Agriculture Spatial Analysis Laboratory shows a split, with the western areas showing greater photosynthetic activity and the eastern reach showing much less. Last year, the entire state of South Dakota was in at least moderate drought. This year, 95 percent of the state is drought-free. In the eastern areas of the Corn Belt, the issue isn’t drought conditions but persistent cold temperatures and lingering snow. Figure 6. 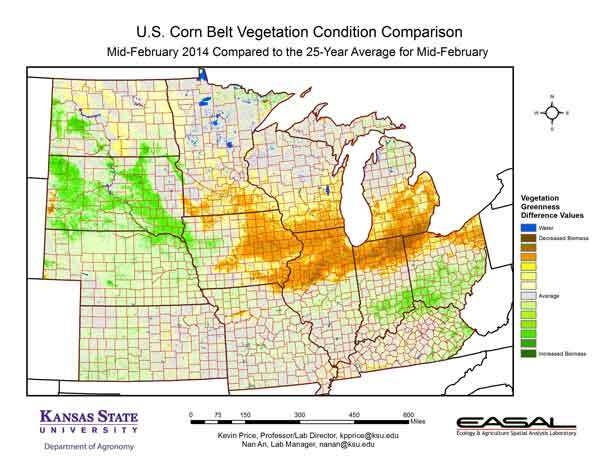 Compared to the 25-year average at this time for the Corn Belt, this year’s Vegetation Condition Report for February 11 – 24 from K-State’s Ecology and Agriculture Spatial Analysis Laboratory shows that lower-than-average biomass production is present from eastern Iowa across northern Illinois and Indiana. On the other hand, South Dakota is showing greater-than-average photosynthetic activity. Snow is one of the major factors. Aberdeen, SD averages 7.6 inches of snow for February. This year, it has recorded only 1.5 inches. In contrast, Dubuque, IA averages 9.2 inches in February, but has recorded 14.1 inches this February. Figure 7. 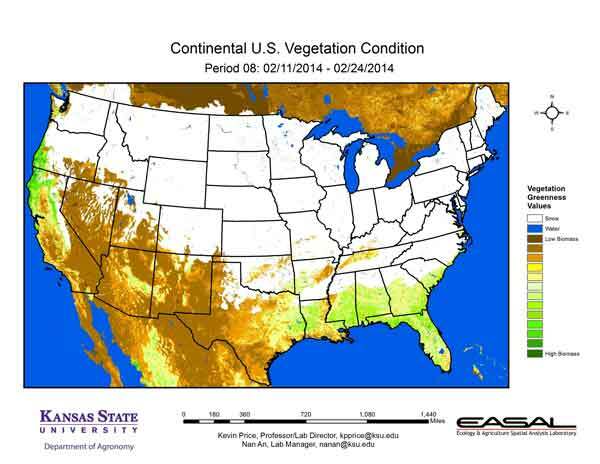 The Vegetation Condition Report for the U.S. for February 11 – 24 from K-State’s Ecology and Agriculture Spatial Analysis Laboratory shows that snow continued to be seen as far south as northern Georgia. Persistence in the southern parts of the U.S. was very limited, with most vanishing the next day. Figure 8. 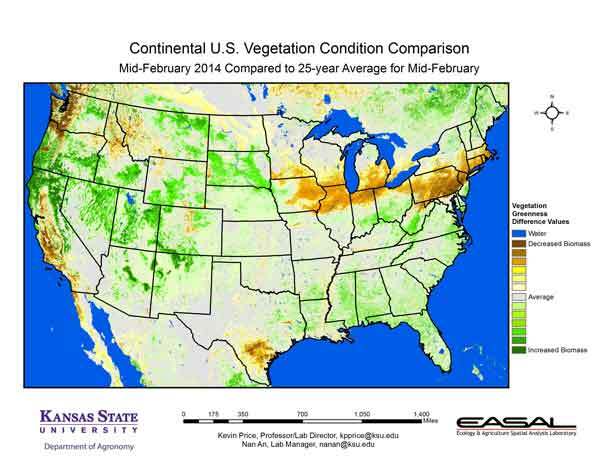 The U.S. comparison to last year at this time for the period February 11 – 24 from K-State’s Ecology and Agriculture Spatial Analysis Laboratory shows that the sharp differences in photosynthetic activity between the Western and Eastern regions of the country continues. The West has seen below-average snowfall, while the east has seen above-average snowfall coupled with cooler-than-average temperatures. This has enhanced photosynthetic activity in the west and limited it in the east, particularly in the stretch from eastern Iowa through New York. Figure 9. The U.S. comparison to the 25-year average for the period February 11 – 24 from K-State’s Ecology and Agriculture Spatial Analysis Laboratory shows that the milder temperatures and lower snowfall amounts has enhanced photosynthetic activity in the Mountain West. In contrast, the impact of colder temperatures and persistent snow is particularly visible in Pennsylvania, where photosynthetic activity is much below average.